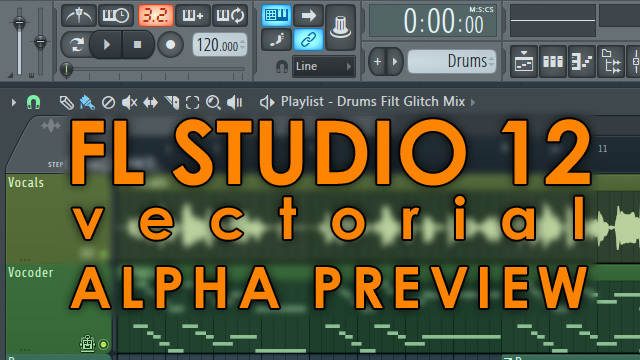 FL Studio owners you can now download the FL Studio 12 ALPHA-PREVIEW to give us feedback about the extensive workflow changes. We are looking for feedback about some of the major changes in workflow that have been made so far. Please try it out and let us know what you think of how it works. We're not really looking for bug reports, at this time. Channel Menu - The Channel Options Menu has moved from the Toolbar Menus to the Channel rack. Channel settings - Have been integrated into the Plugin Wrapper. Interface - Vectorial user interface. See Options > General Settings > GUI display. Per Channel Swing - The Channel Settings now has a 'swing multiplier' amount. Pattern Menu - The Pattern Menu has moved from the Channel rack to the Toolbar Menu and Pattern Selector. Playlist - Multiple drag and drop for audio files onto Playlist (from a Windows file browser). Stepsequencer - Stepsequences are now interchangable with Piano rolls. VST Plugins - VST plugin installation has changed. This is not a finished version of the program, it's not even a beta version of FL Studio 12. It's a pre-beta, still under construction, so it's likely to change significantly prior to release and projects made in it may not be compatible with the final version. What about FL Studio 64 Bit? This FL Studio 12 Alpha is a 32 Bit. The 64 Bit version of FL Studio 11.1 is available here. FL Studio 12 will also be available in 64 Bit at release. When will FL Studio 12 be released? We can't give you any dates yet, but don't expect it anytime soon. There is still a lot of work to be done. For example, the Mixer hasn't been updated yet.